Home » New Pokies » Batman and The Joker to grace Playtech Casinos soon! Batman and The Joker to grace Playtech Casinos soon! Playtech has developed another pokie that borrows its influence from DC Comics. The pokie features DC Comic characters like Batman, The Joker, Batmobile, Batarang folding knife, Robin and Batplane among others. Playtech software developer is behind the development of this exciting machine game. Playtech is known to build their games using state of the art technology. They are able to pass these games to the gambling community through their strong relations with licensees across the globe. Playtech has a myriad of products like casual and fixed odds, server supported terminals, sports betting, live games, poker and bingo. Batman & The Joker Jewels pokie has 5 reels, 3 rows and 25 winning lines. It is possible to play the pokie from your smartphone devices, tablet computers and desktop computers. The pokie gives you the chance to make more from your gaming with their two bonus features and four jackpots. The pokie has two wilds; Joker smile and the Batman logo. When you get five of a kind of any of the wilds, you will get a payout of 100 times your bet amount. The wild symbols on the pokie have the ability to replace any symbol on the reels to come up with a winning line. The only symbol that the wild will not be able to replace is the scatter symbol. The betting range per spin is flexible enough to accommodate your budget; place a bet from as low as 25p to as much as $500 for a spin. Free game bonuses and four jackpots will make you love Batman and The Joker Jewels pokie. The first bonus game is available when you have three green bonus symbols landing on the first, third and fifth reels simultaneously. Every win you get while on the feature will be multiplied by the Bat-Tastic multiplier meter. You will get a multiplier of five when you choose Clown Prince of Crime or Caped Crusader. 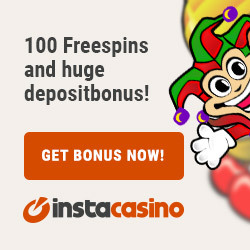 The exciting aspect about this feature is that it does not have a set number of free spins. You can get as many spin as your luck can get you! The feature ends when you have the meter landing on end. The second bonus game is called joker random wilds. This feature is activated at random as you make your spins on the base game. The Jester Jackanapes will get loose on the reels bringing you multiple rewards. You can get rewards of as many as nine wild symbols. 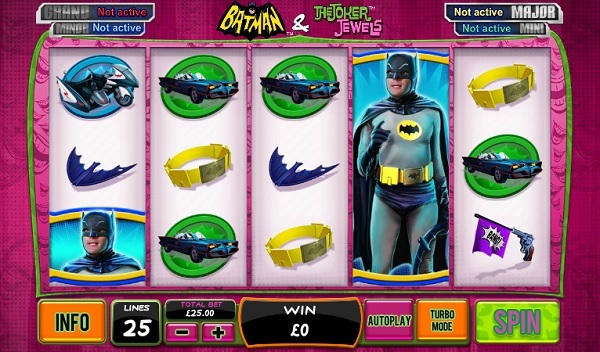 The progressive jackpots are the most lucrative features of Batman & The Joker Jewels. This feature which houses the four jackpots is known as the DC Super hero Jackpot Game Feature. The bigger the bets you make, the higher your chances are of bagging a win. When you get into the feature, be sure of getting lucky with one of the jackpots. Since I have not played the pokie yet; I have nothing much to hate about the pokie. The features seem to be interesting enough but let’s hope there will be no disappointments when we get to the gameplay. 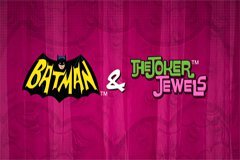 Batman and The Joker Jewels pokie is worth a shot. With a betting limit of as low as 25p, two bonus games and four jackpots, this is a game to behold. Hoping that is will be launched in Playtech casinos soon; we have enough reasons to spend some a portion of our bankroll in the casino.